The new streaming offerings from HBO and CBS are early signs that regular television is the new AM radio. TV is changing for a bunch of pressing reasons: We like to have more control over what we watch and when; streaming over the Internet works well now; we hate paying cable company prices. But more profoundly, television is changing for big, mega-trend reasons. The forces at work, driven by the Internet and data, add up to a giant generational shift toward a 21st century, free-form, urban, mobile lifestyle and away from the schedules, structures, suburbs, offices and marriages of the post-World War II era. In this new environment, the old model of broadcast TV will last about as long as an ice cube in a freshly poured glass of bourbon. “Our job is to do the best content we can and let people enjoy it in whatever way they want,” CBS CEO Leslie Moonves said on October 16 when announcing CBS All Access, the network’s subscription Internet service. “The world is heading in that direction.” Which is true, except that for anyone under 30, it’s already there. Before World War II, life for most people was dominated by time-sucking work in agriculture, factories or small businesses like the local mill or general store. Nobody had much leisure, and even time was a bit arbitrary. As Steven Johnson writes in his book How We Got to Now, before railroads standardized time at the end of the 1800s, every town had its own time. Even if TV had been around then, it wouldn’t have fit with that universe. TV grew up as soldiers returned from World War II and created a new lifestyle built on military-like precision. That generation invented a middle-class, male, white-collar worker who arrived at the office at 9 a.m., ate lunch at noon and left at 5 p.m. to drive home to a newly minted suburb. It was a scheduled, structured existence, giving people a “life” cleanly separated from work. News came in newspapers playing to that schedule, thrown on the porch in the morning before work or in the early evening, before dinner. TV was made for that lifestyle: soap operas for the wife during the day; evening news when the husband got home; prime-time shows starting at 8, when the kids were in bed and the parents were ready to relax with a highball—all served up on one shared screen in the living room. This new video entertainment was so exciting and so fit for the times that everybody rushed to get it. 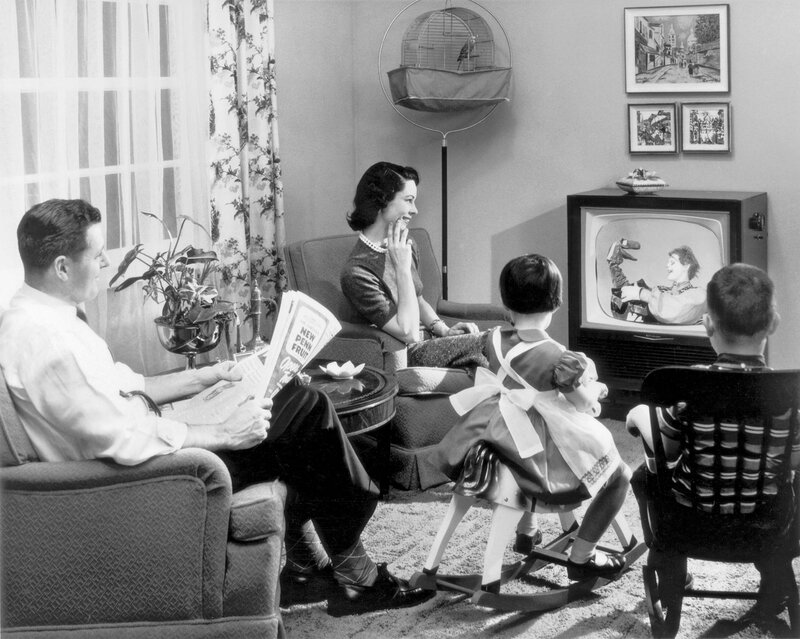 in 1950, 9 percent of U.S. homes had a TV. Only 12 years later, it hit 90 percent. Now, technology is atomizing the postwar lifestyle, especially for the generation that was born after about 1985—half the global population—and grew up with personal computers and, a little later, the Internet and mobile phones. Today’s technology is killing the office and obliterating the line between work and life. A Herman Miller research project concluded: “Long-established workplace norms are giving way to disruption and uncertainty.” The new generation doesn’t care all that much for marriage or home ownership, surveys show. They’re rejecting suburbs and moving to city centers. The home, the family and the office are all getting blown into tiny fragments that you can reassemble any way you want. Life’s old schedules are gone. We work everywhere and all the time, and enjoy entertainment everywhere and all the time. TV has changed to try to accommodate that, adding hundreds of niche channels and DVRs, but it still relies on schedules and structures like cable bundles, and remains centered on a wired single-purpose screen in a fixed place. In October, Apple introduced new iPads and Samsung brought out large new phones, all with stunning screen resolution. These are better TVs than TVs, and they’re completely portable. The new generation can’t figure out why video entertainment was ever confined to the den or living room. An immovable TV connected by wire to a cable company feed seems as outmoded as a rotary-dial phone screwed into the kitchen wall. Meanwhile, members of exploding social networks want to share entertainment across geographies and time zones, virtually resurrecting the feel of millions of people sharing the same prime-time show at the same time. The old TV industry can’t cope with that. Another big blow to traditional TV is data. Netflix and YouTube proved the value of having a direct digital relationship with viewers: You get data about them, and the data lets you cater to them and tailor advertising to them. In every industry in the 21st century, whoever has the best data wins. CBS started to discover that as it tested streaming earlier this year. CBS Chief Research Officer David Poltrack told Variety the network found it can charge 10 percent to 20 percent more for targeted ads on streaming shows versus broadcast ads on traditional TV. For programmers like HBO and CBS, a middleman—i.e., the cable company—is in the way of connecting directly to viewers and getting their data. That’s turning into a pain point for these content owners, especially since said middleman, with its overpricing and Soviet-style customer service, has a long-standing lousy relationship with consumers. From all sides, cable companies have become about as welcome as a wart. In the grand scheme, TV is like a toucan in a mowed-down rain forest, left vulnerable as its habitat gets obliterated. HBO one day; CBS the next. The other content holders will follow, quickly. TV will transform into a collage of subscription services, pay-per-view offerings and ad-supported free stuff, all available over any network on any device at any time. Change happens much the way Ernest Hemingway described the onset of bankruptcy in The Sun Also Rises: gradually and then suddenly. The forces that would break TV built up little by little for decades. Now comes the suddenly part.